Well, would you look at that. Last week my Google Pontiac post was mentioned in a “ClickZ Network” post, and my traffic nearly tripled versus a typical Thursday. Of course, since I was out of town at the time (with a barely-charged laptop and no adapter, even) I didn’t even notice until a week later. Let’s Nip This One in the Bud, Shall We? Excuse me, but what the hell is a “vingle”? Has this word been around and I just haven’t noticed? If so, I want to return to my blissful state of ignorance… because, frankly, like this dude’s overly-Photoshopped upper face, or the “word” Vlogging, something just seems off. We’re in that narrow stretch of time when it’s 25th Feb both here in Chi and down there in Sydney, so I want to take this opportunity to wish the lovely and talented Catherine Bender a most happy 23rd. May the hangover gods be kind to you tomorrow. OK, I Googled It. Now What? As I’ve said before, I don’t catch too many TV commercials. So forgive me if I’m a little behind the curve on this one. Immediately following that commercial was a GMC spot recommending I visit kbb.com to find out how well their “professional grade” vehicles stood up to the competition. I don’t know if it’s pride or desperation that has GM highlighting ostensibly neutral third parties (hey, beats “wee” trucks that drive underwater) but I welcome it. As usual, though, they could use a little help on the execution. So why am I not in Australia again? Do You WANT the Weather? 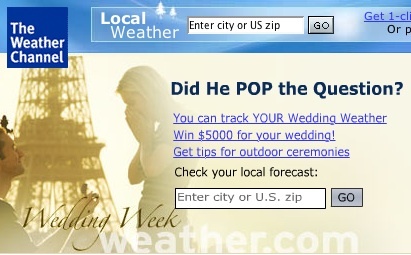 Did He Pop The Question? TEHRAN (Reuters) – Not content with pelting European embassies with petrol bombs to protest against cartoons of the Prophet Mohammad, Iranians have decided to rename the “Danish pastries” relished by this nation of cake lovers. I awoke this morning at my customary hour — at least, I think I did, given that the clock was blinking. Seems we had a power outage this morning. These are not as rare as I’d like, so some time ago I purchased a UPS unit and connected my Mac and Ubuntu machines. Since I tend to have roughly eight billion Firefox tabs open at any given time (have you ever opened so many that they no longer show up? I have), this was a sound decision, but I’m particularly pleased with it today. You see, I’d left the Linux machine chugging away on a two-pass video transcoding job, reducing a big MPEG-2 video file to a smaller Xvid version. That’s something that takes hours and hours, and you can’t just pick up where you left off after a power loss. So: yay for emergency batteries! Hey there! I’m still alive, just not getting Web access as regularly here as at home. Anyway, one thing I forgot to mention in the “Unexpected Pleasures” post is a trailer they showed for Apocalypto. I got a good laugh at the latest proof that the post-Passion Mel Gibson has finally completed his descent into full-on batshit craziness. Good luck with that, Mel! Free wireless at Orlando International? Sure, it’s slow, but way to go anyway! I just hope they don’t go talking to the jerks at Logan. My ticket was only $8, down from what he originally rang up ($12.) I’m not sure if that represents a midnight discount or just an intial miscalculation on his part, but I’ll take it either way. You are currently browsing the jsp.org weblog archives for February, 2006.